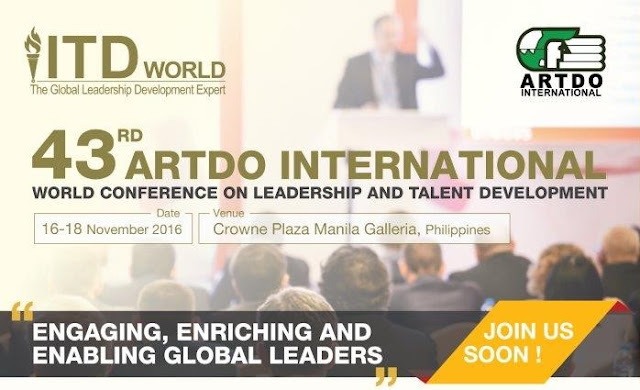 Award-winning HRD company, ITD World Philippines, is bringing together some of the most celebrated global thought leaders and people development professionals as it hosts the 43rd Asian Regional Training & Development Organization (ARTDO) International Conference, to be held at the Crowne Plaza Manila Galleria on November 16 to 18, 2016. The learning and networking event will feature more than 25 applicable, highly relevant, and invaluable topics that are easily adaptable in today’s competitive and ever-changing business landscape. 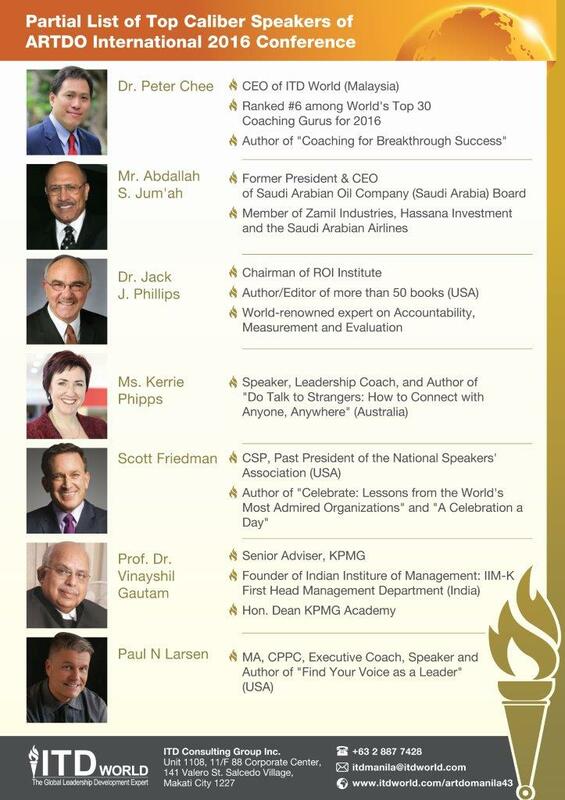 And with the theme “Engaging, Enabling, and Enriching Global Leaders”, attendees will gain vital insights and key take-aways from distinguished experts, interact with top CEOs, and discover the latest tools and techniques on talent-leadership development, among others. Spearheaded by ITD World Philippines country head and ARTDO president, Serely Geraldine Alcaraz, the conference will enable participants to discover how to overcome organizational and individual challenges through comprehensive topics such as Engaging the Global Workforce, Enriching Global Talents, and Enabling Global Organizations. Leading the ARTDO conference programs is a formidable pool of internationally-renowned experts which include Dr. Peter Chee, ITD World (Malaysia) CEO and ranked sixth in the world’s Top 30 Coaching Gurus for 2016; Abdallah Jum’ah, former president and CEO of Saudi Arabian Oil Company and current board member of Zamil Industries, Hassana Investment, and Saudi Arabian Airlines; Kerrie Phipps, expert motivational speaker, leadership coach, and author of “Do Talk to Strangers: How to Connect to Anyone, Anywhere”; Scott Freidman, past president of the National Speakers Association, motivational humorist and author; Dr. Vinayshil Gautam, senior adviser of KPMG, founder of Indian Institute of Management, and Hon. Dean of KPMG Academy; Paul Larsen, executive coach, expert motivational speaker, and author of “Find Your Voice as a Leader”; and Dr. Jack Phillips, chairman of ROI Institute, word-renowned author and expert on accountability, measurement, and evaluation. 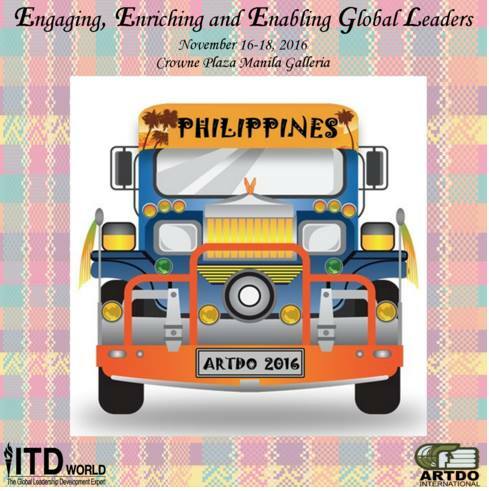 Similar to a jeepney ride, the ARTDO conference will take participants on a journey to uncharted territories—where organizations triumph over trials by engaging, enriching, and enabling its leaders—giving them the opportunity to fully engage with the guest speakers through forums, sessions and talks, as well as interact with other participants to gain different perspectives. Prior to the conference, Dr. Phillips will conduct a Certified ROI Professional workshop on November 7 to 11 to be held at the Crown Plaza Manila Galleria. The 5-day program, themed “Making Human Capital Analytics Work”, will help enable HR professionals to measure the impact of learning and performance improvement programs in their organizations. Engaging, Enabling, and Enriching Global Leaders. ITD World Philippines gathers some of the top global thought leaders for the 43rd ARTDO International Conference—a three-day workshop that will cover relevant topics for today’s competitive and ever-changing business landscape.